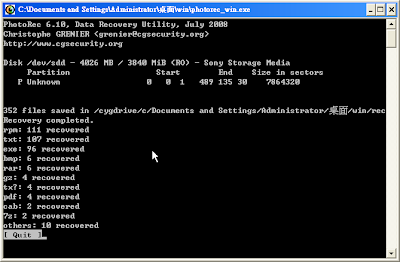 TestDisk is a powerful free data recovery software! It was primarily designed to help recover lost partitions and/or make non-booting disks bootable again when these symptoms are caused by faulty software, certain types of viruses or human error (such as accidentally deleting a Partition Table). PhotoRec is file data recovery software designed to recover lost files including video, documents and archives from Hard Disks and CDRom and lost pictures (thus, its 'Photo Recovery' name) from digital camera memory. PhotoRec ignores the filesystem and goes after the underlying data, so it will still work even if your media's filesystem has been severely damaged or re-formatted.